To replace the Dodge Power Wagon 4x4, in service with the Marine troops based in Africa, the French army chose the TF 4.20 SM known as VCOM from Ateliers Legueu de Meaux (ALM). After two years of testing the 5 first vehicles purchased by the army, the 13th half brigade of the Foreign Legion stationed at Djibouti, commanded by General Dio, received the first overseas combat vehicles. The TF 4.20 SM has a covered cab designed by Pourtout. The service tanks are housed at the front on either side of the winch. Although initially intended for 800 vehicles, the order was finally reduced to 193 examples, all supplied to Djibouti. The body was a platform with tarpaulin curtains. It is equipped with a Ford C5 PG 6-cylinder petrol engine delivering 120 hp, which gives it a top speed of 85 km/h. A version equipped with the Nord Aviation turret, carrying four SS 11 anti-tank missiles with a 3000 m range, was designed as early as 1964 for Lebanon. 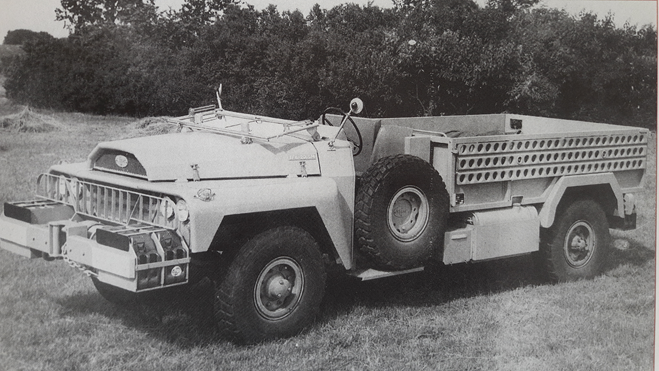 The ingenious and robust design of the VCOM created the reputation enjoyed by its famous successor: the VLRA (Reconnaissance and support liaison vehicle) produced by ACMAT.